It was yet another punishing night for a Tonganoxie opponent as the Chieftains pounded the rock on their way to a 52-6 win over Bishop Ward in the opening round of the Class 4A Playoffs. "We had the rain on and off, so we didn't know what was going to go on, but they came out and fought hard," Tonganoxie head coach Al Troyer said. "That's what we wanted to do. The guys were able to respond when we got down, kind of like what happened last week against Basehor-Linwood, and just keep going once we got the lead." In a game which was played at Bonner Springs because of field conditions, it looked good for Bishop Ward early after they returned a fumble for a TD for the first score of the game, but that didn't last. Following the Cyclones' touchdown at the 9:14 mark of the first quarter it was all Chieftains. Tonganoxie scored 46 unanswered in the remainder of the half to race ahead and never looked back. As is usually the case, the Chieftains went to the ground to get things going. A 5-yard run by Tyler Ford made it 7-6 Tonganoxie. Just three minutes later, Shane Levy ran it in from 35-yards out and it was 14-6. The final score of the first was a pass from Ford to Ben Johnson to make it 21-6 after one. Another connection from Ford to Johnson at 9:27 of the second had the Chieftains up 28-6. Then Johnson scored again, this time on defense returning an interception 55 yards, putting Tonganoxie up 34-6. 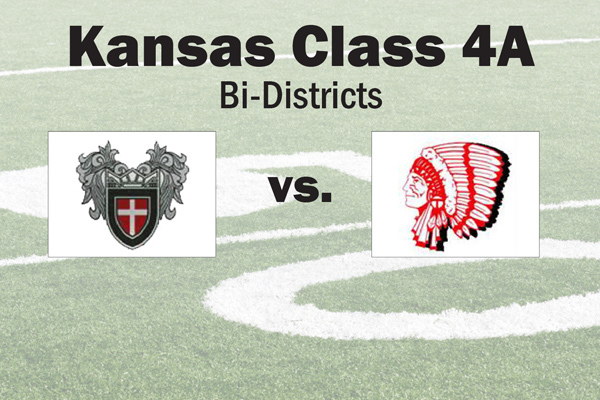 The Chieftains added two more rushing scores as Levy scored for the second time on a 29-yard run, while Jared Sommers got his first TD with just over two minutes left in the second and Tonganoxie took that 40-point lead (46-6) into the half. In the second half with a running clock most of the way the Chieftains added one final TD. Tonganoxie scored on the ground for the fifth time as Sommer's 10-yard rush, his second score, made it 52-6. Bishop Ward's season comes to an end at 2-8. With the win, the Chieftains (9-1) advance to the regional round where they will host 10-0 Baldwin.